Thanks for taking our quiz! Here are the answers. 1. 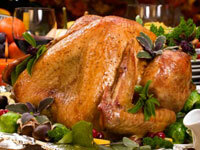 How many calories does a typical adult consume in one Thanksgiving dinner? According to the Calorie Control Council, a turkey and trimmings dinner is not lacking in calories or fat. If we don't make wise choices, we can easily eat as much as 3,000 calories at the holiday dinner. 2. How many additional calories does the average person snack on before and after Turkey Day dinner? We can nibble and drink away another 1,500 calories (the same number of calories that many women can get by with for an entire day) while the Philadelphia Eagles try to make minced meat out of the Arizona Cardinals. Our total daily Thanksgiving Day calories can be enough to last us for more than two days, and we can eat enough fat on that day to last nearly four days. Instead, go into the holiday with a game plan: Eat a portion-controlled breakfast and a filling snack or lunch, depending on what time the big meal is served—and resist the urge to munch aimlessly throughout the day and during food preparation. 3. Eating a 3 1/2-ounce serving of white meat turkey without skin shaves how many fat grams—mostly saturated—from your main course? Turkey is one of the lowest calorie and leanest protein sources—if you don’t eat the skin. A serving of roasted white meat has just 157 calories and 3 grams of fat. Dark meat without skin has just 187 and 7 grams of fat. However, dark meat with skin has a whopping 11.5 grams of fat (nearly 3 teaspoons of fat), and more than 3.5 grams of it are heart-stopping saturated fats. 4. Which side dish is the safest bet for seconds? When in doubt, pile your plate with a non-starchy vegetable casserole. A cup of sweet potato or mashed potatoes will debit over 325 calories out of your diet, whereas a green bean casserole is a calorie bargain at 145 calories per cup. Better yet? Enjoy roasted or steamed vegetables this holiday and skip the added butter or cream-based sauces in which we often smother our vegetables. 5. Which alcoholic beverage is best for your waistline? Light beers are the skinniest sips when it comes to alcoholic beverages. You can find several that have well under 100 calories per 12-ounce bottle. Wines are the second best option, at about 120 calories per 4-ounce serving. Mixed drinks are the most calorie-rich and often contain 400+ calories each. If you like distilled spirits, try drinks that mix with diet sodas or club soda. A shot of any alcohol is just 80 calories. 6. If you’re watching calories, which holiday pie is the best? Pumpkin is the slimmest pie option around, and one of the healthier desserts because it is packed with beta-carotene, fiber, and lots of vitamins and minerals. A slice (1/8 of a 9-inch pie) has 325 calories, compared to 355 in a slice of apple and 455 in a slice of pecan. To cut calories back even further, look for pie crusts made with oats or graham crackers instead of shortening- or butter-based crusts.